While creating a series of graphics (using TikZ) in ConTeXt, I frequently use ConTeXt's buffer to "copy-paste" code. Is there a LaTeX package that implements this feature? Since most LaTeX users may not know what buffers do, let me explain that. Suppose I want to draw a graph in steps: in the first step, only draw the nodes, in the second step draw the edges, in the third step highlight a part of the graph. This will give me a pdf file with three pages, that build up the graph in steps. How do I do the same in LaTeX? I can use the preview package to extract TikZ pictures on individual pages, but don't know how to build the graph in steps. One option is to use beamer overlays to create the graph in steps, but creating a presentation for each figure appears to be an overkill. I can just copy paste code, but that is difficult to maintain in the long run. Any suggestions?
! Package pgfbasematrix Error: Single ampersand used with wrong catcode. 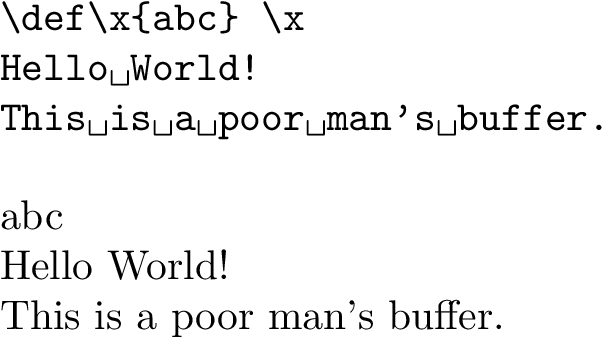 Based on what buffers do, the filecontents environment combined with \input (for \getbuffer) and \verbatiminput (for \typebuffer) comes closest, I think. The following code shows three possible solutions to the updated question. You could write a wrapper to implement a more ConTeXt-like buffer interface, but for this simple example I think it's fine as-is. You can emulate a poor man's buffer using toks registers and e-TeX's \scantokens. As you can see \typebuffer does not work as intended but \getbuffer seems to work fine. This is a poor man's buffer. You could use the Beamer package which works well with Tikz. I am actually looking for the ConTeXt equivalent of this. Thanks for your tip in your question. But do you know if and how ConTeXt could do it without generating multiple pages for these "overlays" (in the language of Beamer)? Beamer has a really good manual called the Beamer Guide. Not the answer you're looking for? Browse other questions tagged tikz-pgf programming context or ask your own question. Is it possible to separate the input and output of LTXexample such that I can put each in a table cell?